Matching gifts are the pot of gold at the end of the nonprofit rainbow. While your donors have built your rainbow with their unwavering support, the potential to increase your donations even more is still waiting at the end. 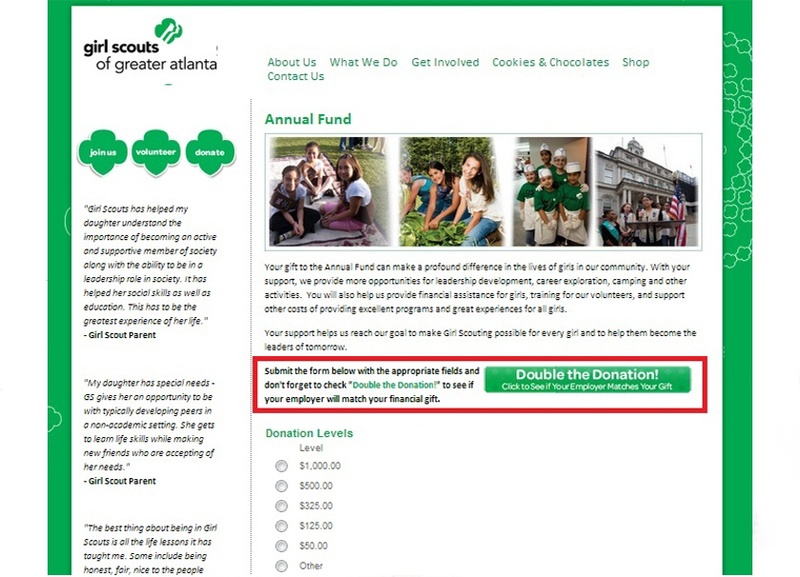 programs, you’ll need to incorporate matching gifts into your online fundraising strategy, too. If you’re ready to watch your donations double like magic, let’s get started! Matching gifts are corporate programs that allow your donors to potentially double their donations to your organization with the help of their employers. If an eligible donor donates a gift, he can then submit a request to his employer and his employer will match his donation. So if he donated $100, his company will potentially donate $100, doubling his donation, so long as the nonprofit is eligible as well. 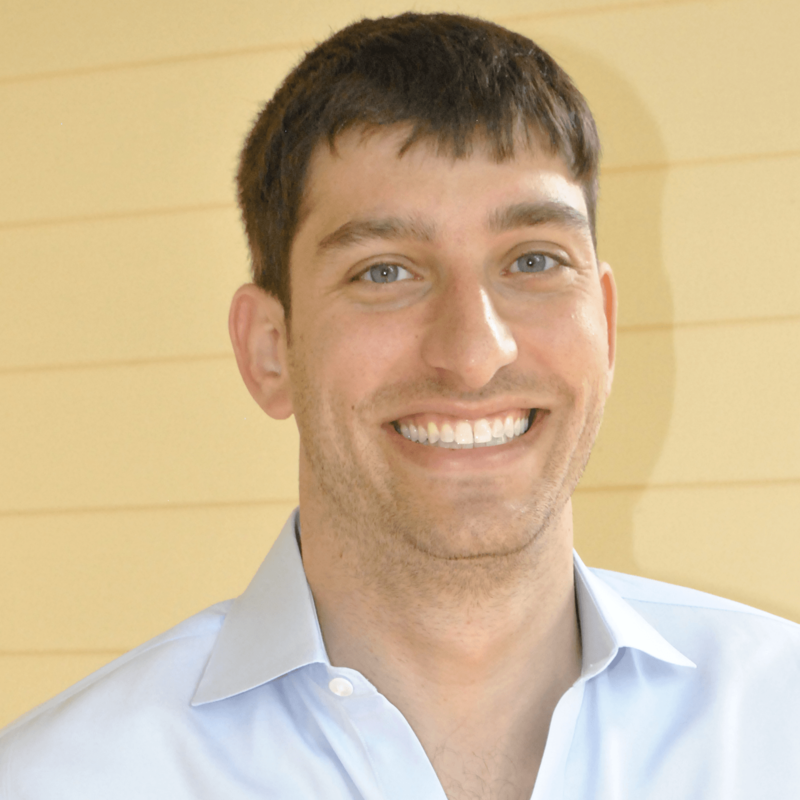 Many companies match donations at a 1:1 ratio, though some match at a 2:1 ratio. Typically, full-time employees are eligible and sometimes part-time employees and retirees are eligible, too. There are also minimum and maximum donation requirements that companies will match. Minimums can range from $1-$100, but are most commonly set at $25 while maximums typically range from $1,000 to $15,000. Matching gifts are crucial to your fundraising strategy, when it comes to fundraising planning and execution, because they’re easy money. With little extra work for both your organization and your donor, your donations can be doubled. You’ve already done the hard work in acquiring donors and encouraging donations, so making sure donors submit their matching gift requests is just a small extra step with a huge reward! Why aren’t matching gifts capitalized on more often? 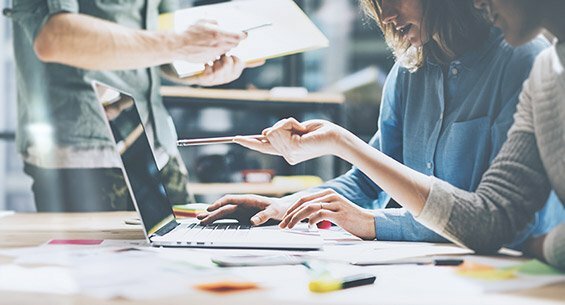 Nonprofits struggle with utilizing the benefits of matching gift programs because of limited information on donors’ employers, gaps in knowledge of specific corporate giving programs, and difficulties communicating guidelines and instructions. Make sure your organization thoroughly understands matching gifts. Each staff member should understand what the program is and how donors can submit requests. By educating your entire staff, each member can help donors themselves. However, if you have the demand and resources to support it, you can consider bringing on a matching gift coordinator. Then all matching gift duties will fall unto him/her/they and your staff can turn to him/her/they with questions. 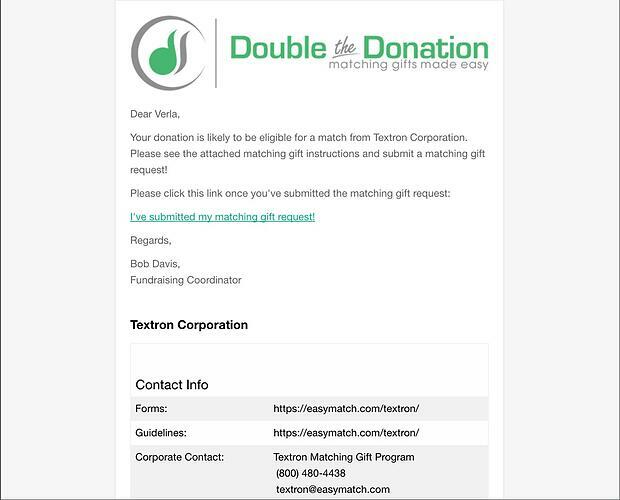 The easiest way to get the word out to your donors about matching gift programs is to incorporate matching gifts into your online donation forms! By inserting their widget right into your donation form, your donors can search their employer’s programs without leaving the page or the donation behind! 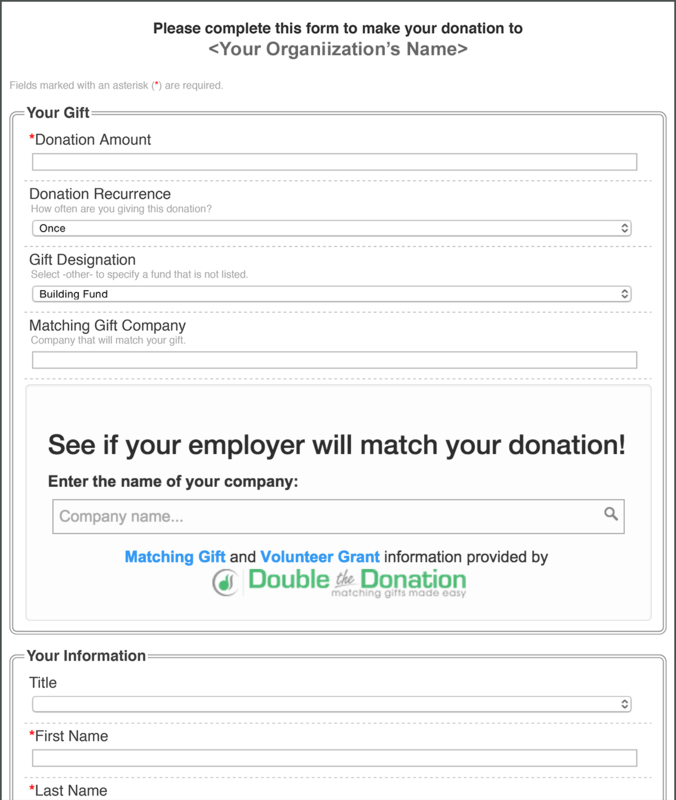 When donors type their employers in the widget, it searches through Double the Donation’s database of corporate matching gift programs. 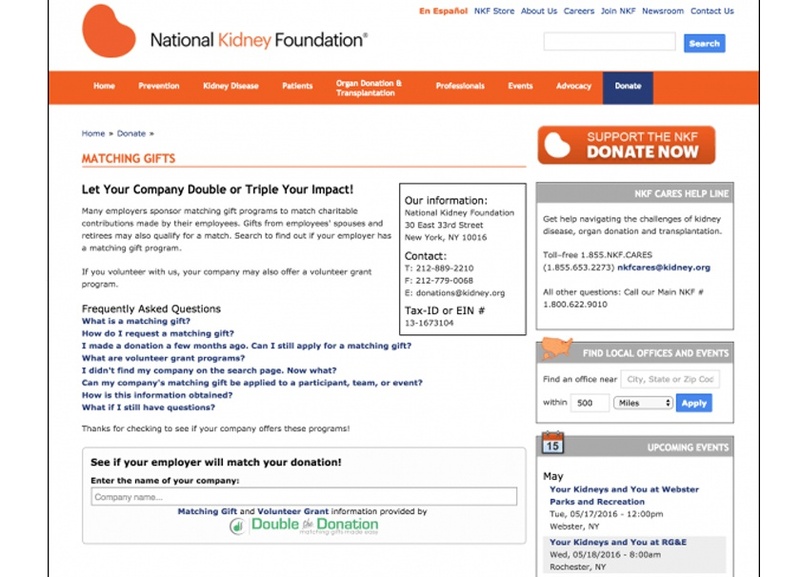 Every donor’s search is as up-to-date as Double the Donation’s resources are! Their database updates regularly, which means your organization’s widget automatically does, too, providing the most employer search results possible. Incorporating your matching gift solutions into your donation form makes the process of identifying eligibility easier for your donors, and the easier the process is, the more likely they are to do it! To simplify your matching gift process for next time, you’ll need to keep detailed records of what went right but also which donors were eligible. Try integrating your matching gift tool with your CRM for an easy migration of data. This way, when a donor enters information about their employer’s matching gift program, all of that data will be transferred and saved in your donor management software. With this information, you’ll know who to send what type of content. In other words, your marketing strategy for matching gift-related information will be more informed and you can send this content to donors who are matching gift eligible! Plus, with the help of your CRM and its tracking metrics, you’ll be able to determine how many of your donors are matching gift eligible and how many are submitting their requests! You can also use these reports to show your board the positive impact matching gifts have on your fundraising strategy and overall revenue. With a widget like Double the Donation’s, your integration possibilities are endless! You can even add this handy widget onto your very own matching gifts page on your nonprofit website. We suggest positioning this page on your top navigation bar with your donation form so it’s readily accessible. You’ll simply have to insert their code to integrate the plug-in into your matching gifts page. You’ll also want to provide some general information about matching gift programs for your donors who are unaware of these programs’ significance. This is also your chance to put your matching gift knowledge to the test! Invite questions from your donors, so you can help them to understand the program and their role thoroughly. When they realize they can double or maybe even triple their donation just by submitting their paperwork, they’ll jump at the chance! Bonus: Tell donors about volunteer grant programs, which will give nonprofits grants based on the hours their employees volunteer for! Check out 360MatchPro’s Top Volunteer Grant Companies for more information. As previously mentioned, you’ll want to promote matching gifts on your donation form and on your website, but you should also spread the word on social media, too! 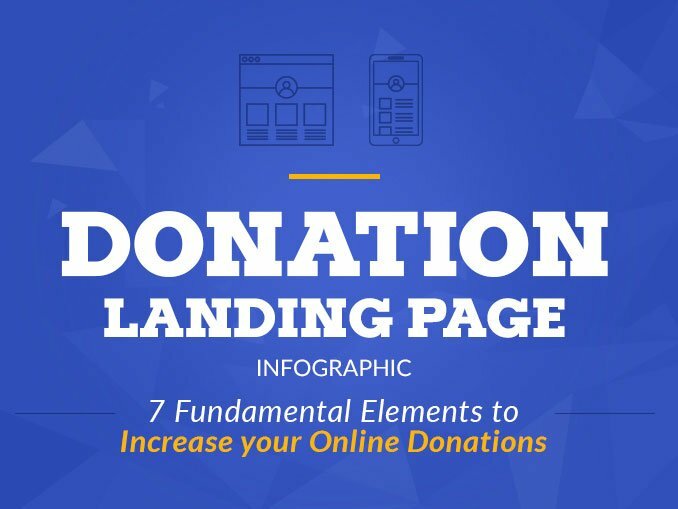 By using a platform your donors already love, they’ll be receptive to this essential information. Between Twitter, Facebook, and Instagram, you’ll have so many different sites and ways to share this information. 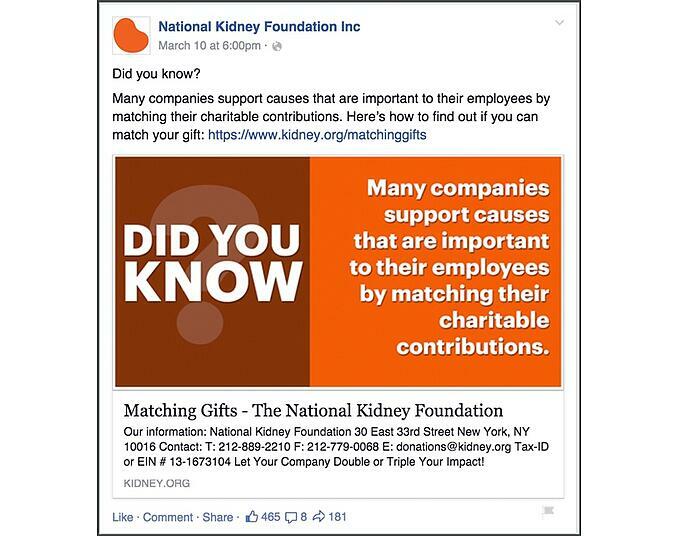 While Instagram is visually centered, both Facebook and Twitter are text-based, so by sharing matching gift information through photos and compelling copy on the appropriate platforms, you can reach donors through their preferred sites. You can even encourage your followers to share your information on matching gifts. That way, their followers will see it, too, and you can expand your donor base! Since you’ll already be sending out thank-you’s and acknowledgements after donors make a contribution, you should include information about matching gifts! Include your usual gratitude for the received gift and then include information on how easy submitting a matching gift request is and how much of a positive impact it will have on your organization. You can also a include a link to your matching gifts page to help your donors start the process! Matching gifts are imperative to improving your online fundraising strategy. With the potential to double your donations and our 7 helpful tips for integrating matching gifts into your strategies, your organization is unstoppable! All that’s left to do is invest in matching gift tools to start collecting donations.